Master and control the laws of physics by using the iClone Physics Toolbox in your animations! Physics Toolbox is an essential plug-in that allows animators to create and manipulate realistic physics interactions with 3D models in real-time for incredibly quick and easy results. This must-have plug-in contains more than 30 powerful physics-based tools which you can utilize in combination to construct your own complex mechanical models or as stand-alone creators of force to power your scene. Assemble physics powers into incredible machine! This pack includes 16 basic L1 Force components such as motors, sliders, springs, and transformation. The L2 Structures consist of more complex machines such as claws, vehicles, tank tracks, as well as hydraulic tools and transporters. This tool set allows you to transform any creative idea you have for a structure or machine into 3D reality! Now arduous animations such as rotation, hovering, shooting, springing and explosions are all made easy with a few simple clicks. Animators can do just about anything! You can build and control motorized 4WD vehicles, tank tracks, robot arms, weapon systems, construction vehicles and more. Users can even add particle dynamics, or use these tools to control cameras and lights. Find millions of free models on Google's 3D warehouse, or acquire thousands of high-quality props from iClone's Content Store and power them with the Physics toolbox. One of the most valuable features in the Physics Toolbox is the ability to save countless hours on keyframe animation by performing real-time physics simulations. Not only is it a huge time-saver, but the results will likely come out more smooth and natural in the end as well. The Physics Toolbox is driven by LUA script and utilizes a easily customizable UI to provide functional controls for your on-screen physics props. You can manipulate properties such as speed, rotation, axis, and more! Immerse yourself in a game-like interactive world and bring your animation to its full potential with iClone's real-time physics-enabled Physics Toolbox. 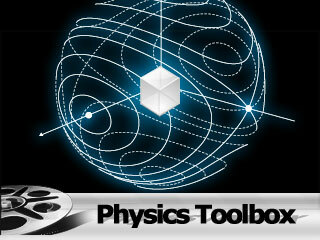 The Physics Toolbox incorporates the Bullet Engine physics system. iClone 6 users will need to switch from the default PhysX Engine to the Bullet Engine in the Project Settings panel for proper results.